Work consists of AT/FP upgrades for two access gates in Gulfport, MS. 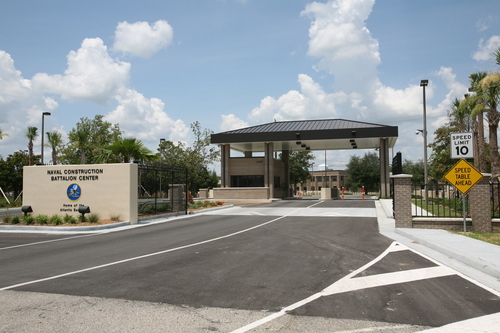 The design-build project includes two guard houses and one 6000 square foot visitor center. TJC designed fully compliant AT/FP facilities with remote security monitoring and barrier activation. TJC integrated aesthetic features such as painted concrete pipe bollards in to the design to soften the AT/FP impact on the overall Base Architectural Plan. Barrier was not installed per plans and drawings at Pass Road. QC Manager required contractor to re-work wall to meet plans and drawings. Engineered fill failed compaction tests due to unsuitable soil. Bad soil was hauled off-site and replaced with clean fill material and acceptable compaction test results were achieved.